Interior Designing is to make a space beautiful & functional. Planning, remodelling and furnishing are all things you can leave for me. From London to Budapesti, I've designed comfortable and livable homes for families of all shapes and sizes. 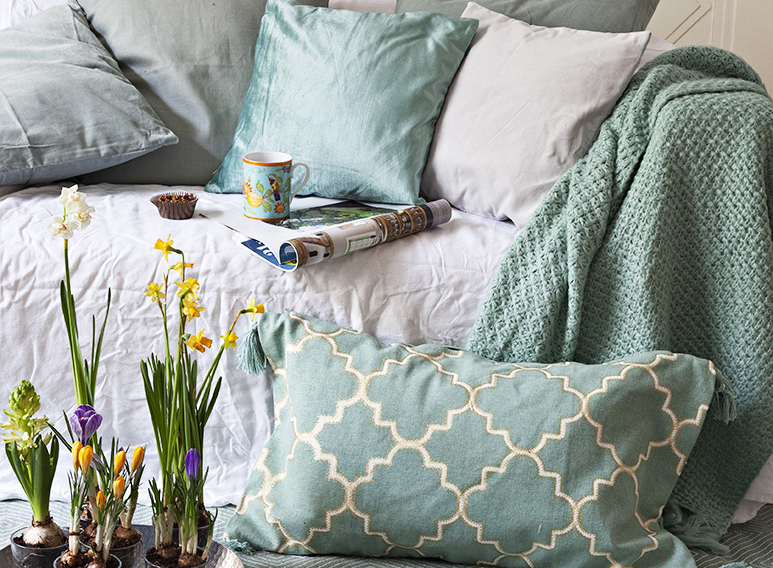 Home-staging is essential when you're selling your property. Nicely furbished space always looks more inviting than an empty one. If you need help on planning parties, beautiful settings for your homepage, unclutter your home or office - just name it - I will style and deliver a new look. You can feel the unique Andalucian atmosphere and living in this renovated home in Los Pacos, Fuengirola. It used to be pretty dark with dungeoun vibes. After knocking down some walls, the whole downstairs got a total make-over and new inviting feel. We didin't want to make it too sleek, yet have that "Andalucian style meets Scandinavian design" feel & look. The upstairs with four bedrooms and two bathrooms was an easy job - just needed new paint, new handles for wardrobes and new textiles. The master bedroom's en-suite got new marble pattern tiles for the shower, flooring, vanities, mirror and lighting. Meanwhile the other bathroom upstairs only needed a new mirror, lighting and shower screen for the bath tub. There was already a Finnish sauna downstairs but without a shower, so that small bathroom was totally renovated and a shower added. Originally this space had three separate rooms: kitchen, living/bedroom and entrance. Now it's turned into one big space with places to all the essential functions. It has that loft atmosphere. 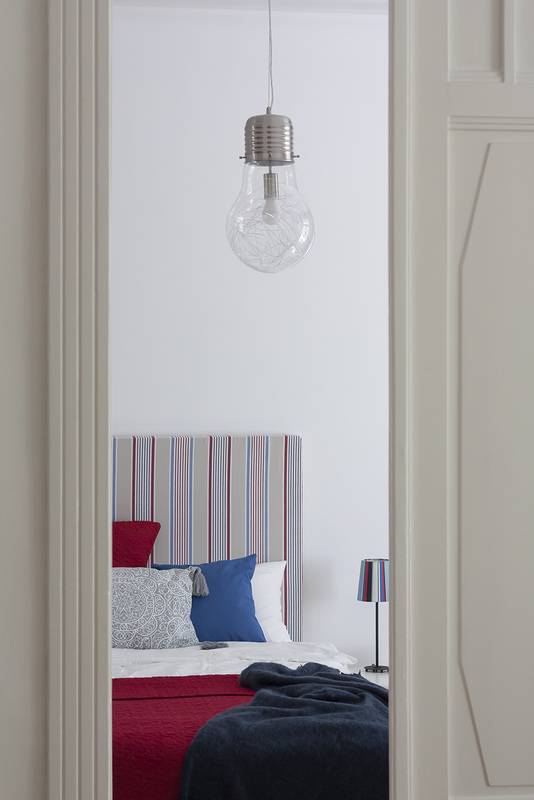 The goal was to keep the colours as neutral as possible, and to create a cosy, modern yet timeless atmosphere. The kitchen was totally renewed and intergrated to the space so that it's nicely part of the living area. eve though it is kept very minimalistic, it is still functional and have all appliences. Bedroom area was separeted with a wardrobe. The otherside of wardrobe was covered with a leafy wallpaper. Green was chocen as the accent colour - it brings the nature inside to this city apartment. Photo collage on the wall. Updating a flat and making it more suitable for the needs of the owners is always a fascinating task. In this 3 bedroom vacation home in Fuengirola, Spain, the living & dining area as well as 2 guest bedrooms were refurbished to create an airy & light atmosphere. The views from 13th floor are amazing, so no haevy curtains for the lounging are, but as the famous Mediterrenean sun is pretty bright all year around, the bedrooms needed blackout blinds and side curtains to make a cosy feel. Located by the river Danube, this is a perfect place to live away from the city but still near-by everything. This apartment didn't need any major renovation, just some white paint for the walls. Decided to keep everything light for this young family. Ocean blue is the favourite color of the mother of two, so I added pops of it here and there. This house built in the 50's went under a total renovation. Everything in this house is now brand new. The wish of the owners was to have a light and airy weekend home for the whole family including the grandchildren. The two-story house has four bedrooms and four full bathrooms. Sunny yellow and neutral grey create a modern, chic and playful feeling around the entire house. 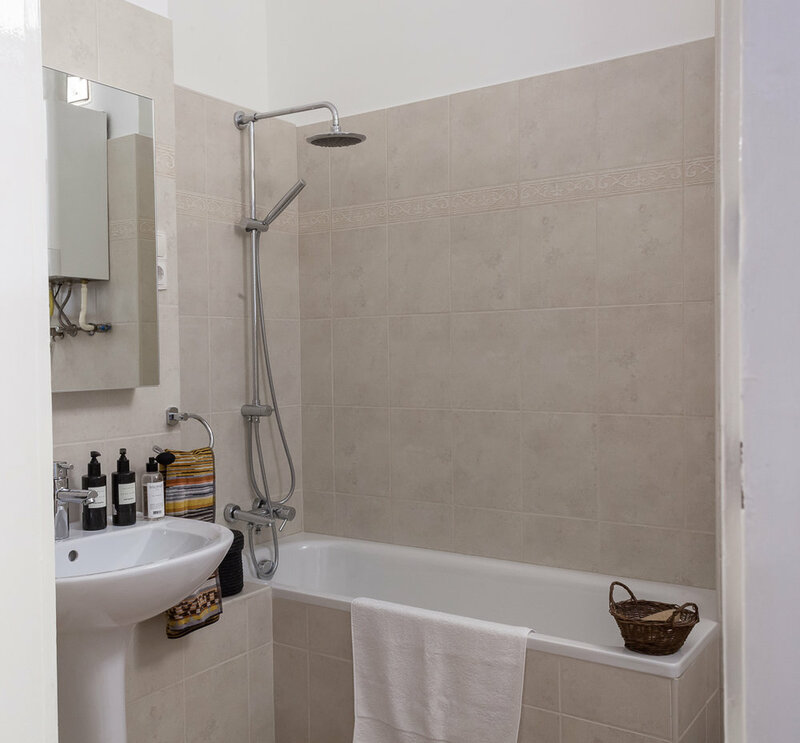 This two bedroom apartment in an old building in the heart of Budapest was bought for rental purposes. The owners wanted to have a light, functional and furnished apartment which is ready to move-in for a tenant. The two bedrooms were made for two students sharing the living room, kitchen and bathroom. Both kitchen & bathroom went under total renovation. Walls were painted and windows changed in every room, and an air conditioner was added. With white walls a hint of blue and red creates a nice & fresh feeling to the home. Started with the existing green couch. 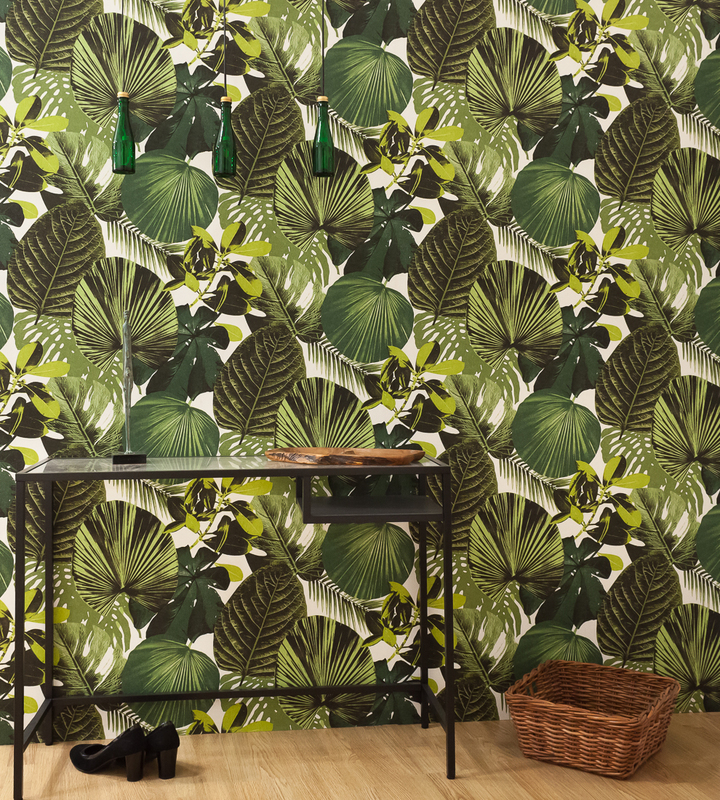 This house in Helsinki is located by a golf course so sticked with the color of green and added a statement wallpaper called Palm Leaves by Cole & Sons. Otherwise wanted to keep it simple and chose mainly black and white items. 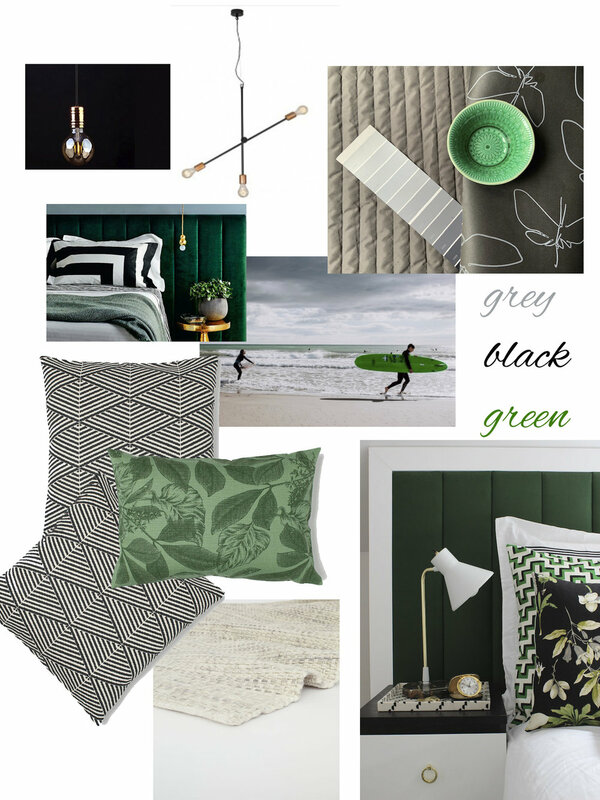 Moodboard for a guest bedroom. My client had shown me the wallpaper she had bought, and the existing dark grey bedspread she wanted to use. I came up with the idea of adding green as an accent colour. I'm so sure the room will look fabulous! Btw, if you are interested in the surfer photo wall art, you can find it on Etsy. I have made several collections which are all instant download photos meaning you can print these high resolution wall art photos at any size you wish.